With a new baby, trips are hard. There’s the schedule or lack thereof, there’s all the stuff, there’s the lack of sleeping, all the crying… it’s just rough to go places with an infant let alone three other kids! But sometimes it’s worth the effort for family gatherings. Last summer, Brett’s grandpa turned 85, so we loaded up our new crew of six for the first time and headed to Tulsa for a family celebration. While we were on the road, we figured we’d maximize our outing with some family fun on the way back. But at first glance, I thought it was a lost cause. There is nothing to do between Tulsa and Kansas City, blah. Wrong. We did this all as stops on our way back from Oklahoma, but this would be a fun mini-trip if you’re looking to get out of KC for a night! In preparation, I googled around for a park because I knew the kids would want to get their wiggles out after hours in the car. I found something far beyond your average playscape. 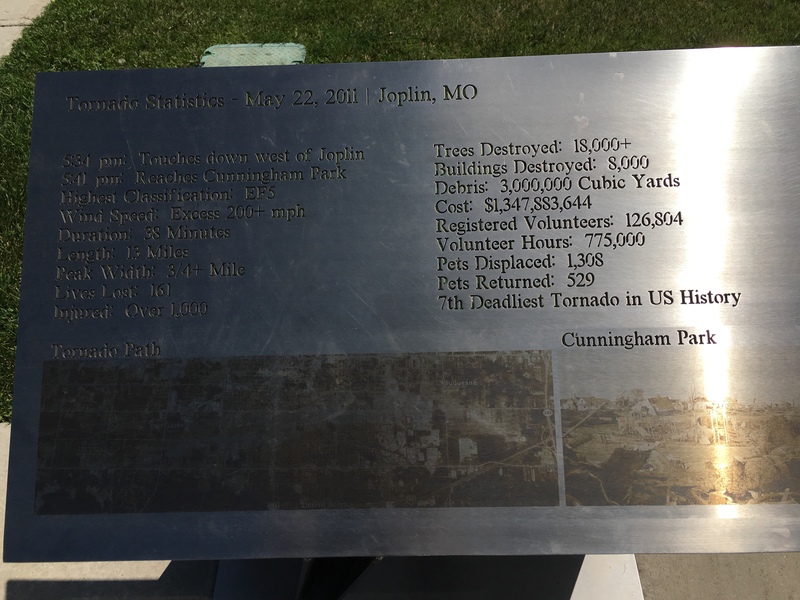 Cunningham Park was built in there area where the 2011 tornado flattened the town hospital. 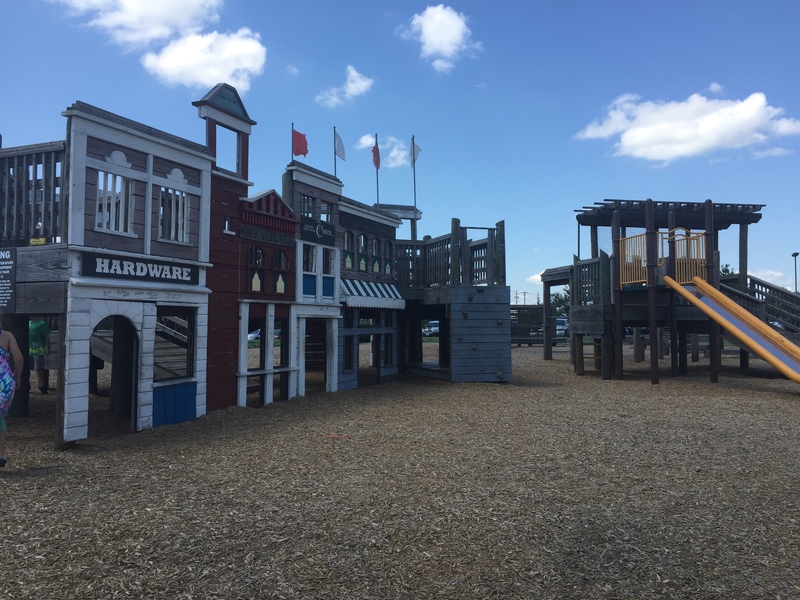 The park features a small Western-style town, a huge playscape, a toddler playscape, a fish pond, and a memorial to the 158 people killed in the tornado. The day we went was a bright and sunny 96 degrees! It was sooooo hot. But the park was so fun that the girls didn’t want to leave. It was sobering to watch my kids play next to the tornado memorial and think about the families that were impacted by such a disaster. 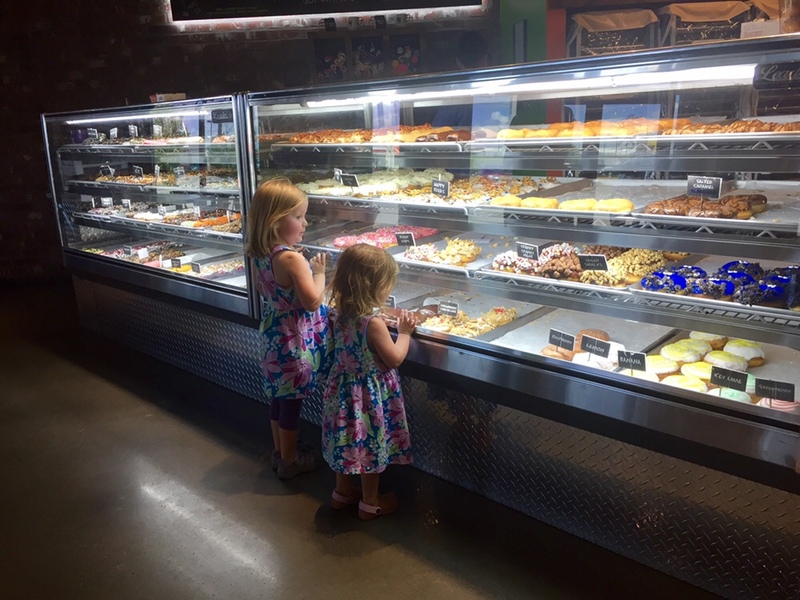 We needed a little snack after all that playing, so we headed over to Hurt’s Donuts. There is not a Hurt’s location in the Kansas City area, but their reputation goes far. Their selection produced awe and glee from the girls. We left with Starry Starry Night, Grape Balls of Fire, ET, Cotton Candy, and Red Velvet. 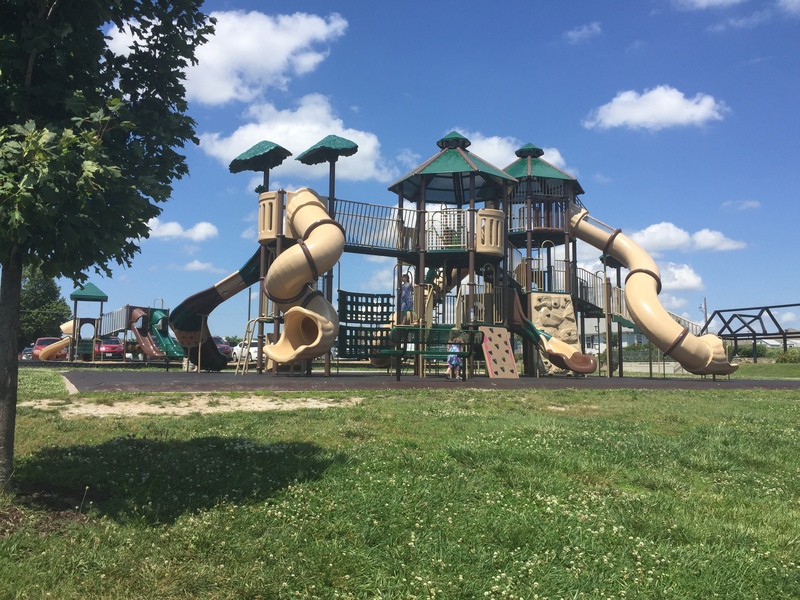 There are several other activities in Joplin that I noticed as I was looking around. The Rangeline Golf Center has a mini-golf course that looked fun. And there is a Museum Complex with some unique offerings, but they are closed Sunday and Monday (when we were there). The best source of information was the JoplinMOLife blog. We were excited to find a Homewood Suites in Joplin as it is our first choice of hotels for many reasons. For our family size with a baby, suites work the best for getting everyone a good night’s sleep. And it’s not just a half-wall between a little couch and a bed. There is a small kitchen, a living room, and a separate bedroom and bathroom. The Joplin location only has one-bedroom suites, but some offer two-bedroom options. The breakfast is fantastic, but on Monday-Thursday nights they also serve dinner! Included with your stay. Very convenient, and they even offer adult beverages. We were sad to miss this on our Sunday night stay and instead headed to McAllister’s for their 99 cent kids meals. In the morning, we headed north to our next destination. This was a very spontaneous stop, and I had done no preparation beforehand. 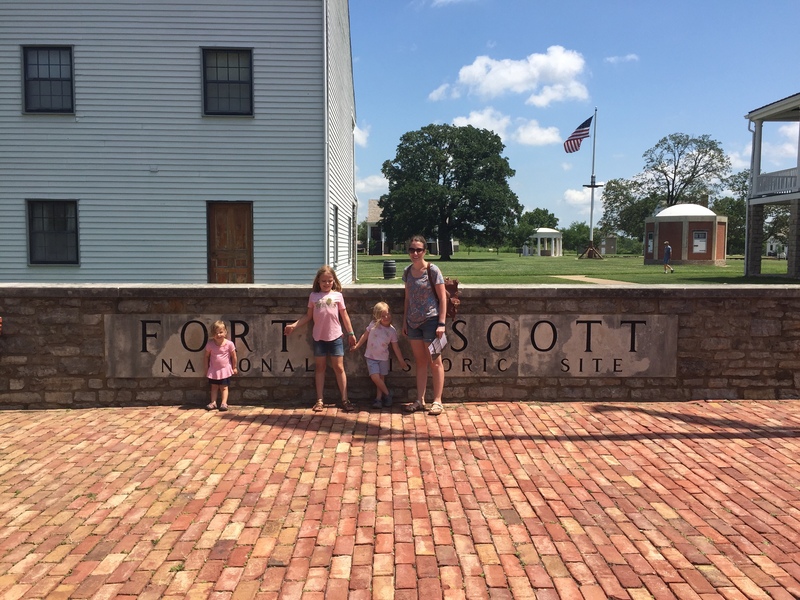 As we drove down, I saw the actual Ft. Scott by the road and thought it might be an interesting place to check out. We stopped in first to get the map and were introduced to their Junior Ranger program. There was a book with activities for each building plus a bag (which you return) with hands-on items. Since it was ridiculously hot and we only had one for which it was age-appropriate, we didn’t end up doing much, but it was a fun surprise as I hadn’t be sure how kid-friendly they would be. We will definitely do more when we go back. 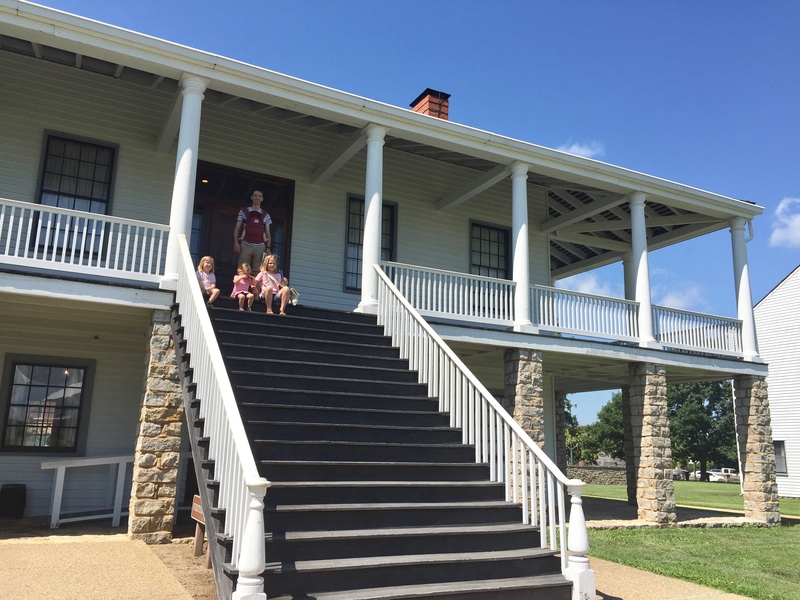 The Junior Ranger program may be kid-friendly, but the buildings and stairs are not stroller-friendly. 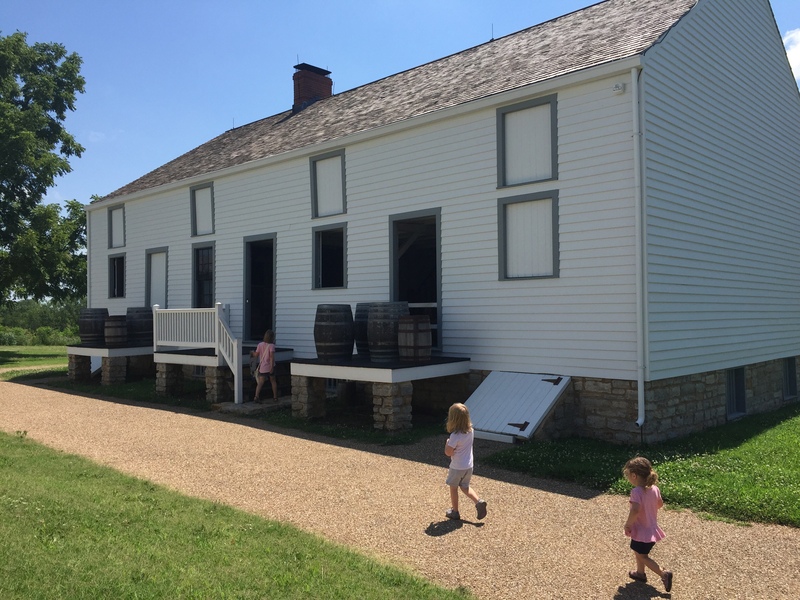 Inside each building were exhibits that provided good information about daily life in the 1800’s, not just military life. We had just read “Little House on the Prairie,” so the girls had some context to the time period. I was amazed at the logistics of running the place. We learned the men took turns in the bakehouse cranking out 100 loaves of bread a day! We went through quickly due to the heat, but I am looking forward to going back when the kids are a little older and the weather is better. When we returned the Junior Ranger bag, Hannah took an oath promising to preserve the landscape and respect history. Our stops in Joplin and Ft. Scott were so much more fun than I anticipated. In a short amount of time, we were able to do a lot of things without being too far away from home. With a family of six including a refluxy cranky baby, I did not have high expectations. But we made some good memories and look forward to repeat visits! 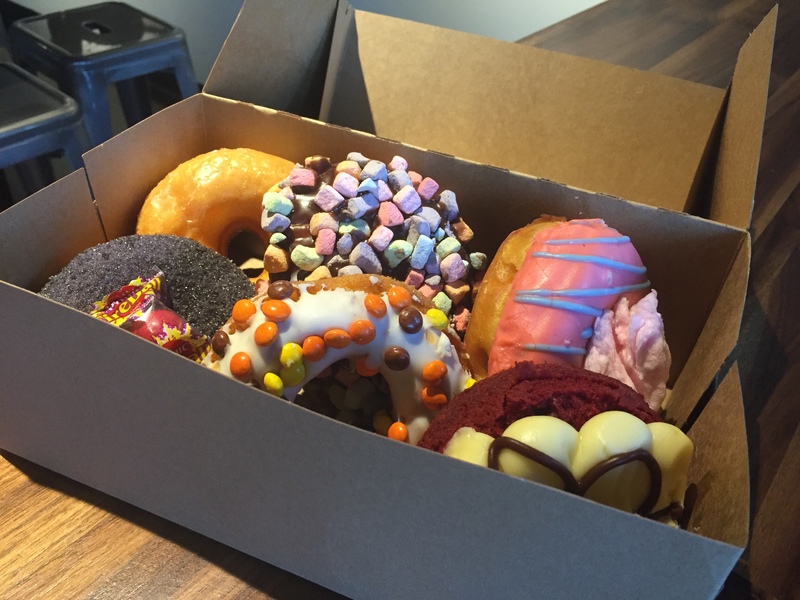 This entry was posted in Family, Food, Fun by Diana. Bookmark the permalink.